It is hard to believe that the “second season” has arrived for all Kansas high school football teams. District play will kick off for all remaining 11-man classes this week and with it comes fewer match-ups between ranked teams, although there are a few on the schedule. Before we analyze the big games for this week, let’s take a look at the Week 7 Kpreps.com rankings powered by Pinamonti Physical Therapy. Are we finally seeing some stability in Class 6A? Derby remains in the top spot for a second consecutive week after the 6A No. 1 lost in each of the two weeks prior. 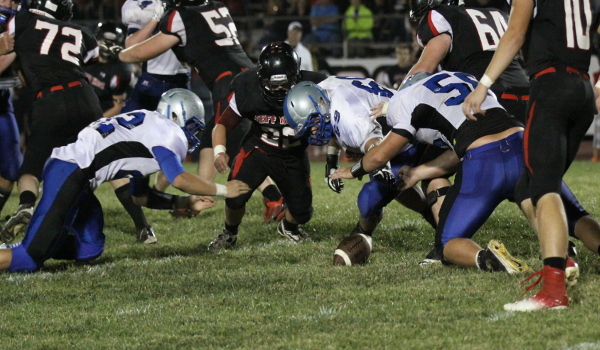 The Panthers were impressive in shutting out an injury-riddled Hutchinson team , 36-0. Lawrence Free State remains in the No. 2 spot after getting a Stan Skwarlo touchdown in overtime to top Shawnee Mission East. The Lancers fall one spot to No. 4 this week as a result of the overtime loss. Topeka High trades places with SM East at No. 3 this week after a hard-fought 21-17 win over Emporia, and Gard ner-Edgerton remains a t No. 5 after handling winless Blue Valley North. Bishop Carroll rolled past rival Kapaun Mount Carmel 42-10 to win the battle of ranked teams in Class 5A. Kapaun drops out of this week’s poll as a result of the loss. Bishop Miege is No. 2, barely, after using a blocked field goal on the game’s final play to secure a 21-19 win over Blue Valley West. The Stags played without starting quarterback Ryan Willis who sat out of the game with a concussion. Blue Valley moves into the No. 3 spot this week after blasting St. Thomas Aquinas, 35-3. The Tigers remain just ahead of No. 4 Salina South, who they beat 35-28 back in Week 3. Finally, Mill Valley remains unbeaten and in the poll at No. 5 after a narrow win over KC Piper. The top four teams in Class 4A remain unchanged as all four teams posted strong performances on Friday night. Top-ranked Holton doubled-up previously unbeaten Jefferson West 40-20, while No. 2 Andale throttled Wellington 65-0. Baldwin continued to roll in the Frontier League with a 51-14 win over Louisburg, and Buhler beat Winfield 41-13 despite losing all-state running back Riley Allen to an injury in the first quarter. The Crusaders will host No. 2 Andale to kick off district play this week. Paola enters the rankings at No. 5 this week after the Panthers scored 49 consecutive points in beating De Soto, 49-13. Paola replaces Coffeyville, which was beaten soundly at Pittsburg, 42-14. The Beloit Trojans are the new No. 1 team in Class 3A thanks to Rossville’s first win over Silver Lake since 2003. Rossville moves up a spot to No. 3 in this week’s poll, one spot ahead of their arch rivals. Beloit rolled to a 42-0 win over previously unbeaten Southeast of Saline thanks to a 240-yard effort from Bowe Behymer. Conway Springs moved up a spot to No. 2 this week after beating their rival Garden Plain, 27-8. Phillipsburg remains at No. 5 this week after beating Thomas More Prep. The Panthers will open district play against No. 1 Beloit this week. Another week without change in the Class 2-1A poll as all five ranked teams rolled to big victories. District play will continue this week with No. 2 La Crosse hosting Sterling and No. 4 Oakley taking on Oberlin-Decatur County in a pair of games that will likely decide the district champion. Top-ranked Centralia will travel to Troy in another match-up that will likely decide both playoff spots. It was another dominating week for the five ranked teams in the Eight-Man, Division I poll as the closest margin of victory was 35 points. That was top-ranked Madison’s 57-22 win over Lyon County League rival Lebo on Friday night. Looking forward to this week, three teams ranked in the poll could get tested. Kiowa County will host a 5-1 Fairfield team, No. 3 Osborne will take on traditional contender Clifton-Clyde, and Marais des Cygnes Valley will likely decide the district championship when they host Uniontown. The Division II poll also remained unchanged as all five teams won by the 45-point rule. Hanover will take on a Blue Valley Randolph team this week that suffered their first defeat at the hands of No. 5 Beloit St. John’s-Tipton last Friday night. Victoria may have the biggest test on the schedule this week as the No. 4 Knights travel to take on Dighton.